The first record of waterfront property ownership on Kushog Lake indicates that it was located in the very south basin – 78 acres on Lot 4 Concession 1. David Keers paid taxes on this property in 1867. In 1912 The Gull River Lumber Company acquired all 78 acres – some say that the lumber company used this building as a dining hall. In the 40’s a portion of this property was purchased by the Gauthier family who were the first ‘cottagers’ in the area. George Wellington Stevens (1857 – 1911) settled on property described as a farm on the west side of Kushog Lake (known as the Harrison farm). Both George and his wife Jane (Sisson) could read and write and George took the 1901 Census for Stanhope. In 1906, after George sold the mill at Buckslides, they moved to Coboconk to run the mill of the Gull River Company. Stevens was Reeve of Stanhope 1897-1899. He had 6 children who, when they went to school, rowed or walked across on the ice to Buckslide and then walked down (sometimes rode a horse) to the cross roads and the #3 Stanhope School. In the north area of Kushog Lake, Francis Kent secured a land grant in 1918; his farm house was located at what is now known as Pine Springs. W. W. Prentice (grandfather of Tom Prentice, who still cottages on Kushog Lake and carries on the family trucking business) purchased the Kent farm in 1927 and developed “Prentuskoka”. Highway 35 was a Depression-era make-work project begun in 1931; the route was deliberately laid out to follow the lakes in order to stimulate tourism. There were fourteen camps for the work crews in Haliburton County. Each camp held roughly 100 people with 8 people per cabin. Therefore, there were about 10 tar paper shacks for the workers to sleep in at each camp. Camp #10 was at Saskatchewan Lake and #11 was at Pine Springs. Part of Ox Narrows Lodge is said to have been the cookhouse and some of the cabins were the construction shacks. Between 1933 and 1940 Highway 35 was completely covered in a gravel surface, from 1941 to 1946 it was retreaded and sealed, and from 1947 to 1958 there was surface treatment done to some sections and paving done to others. In the 1960s it was widened and straightened between Minden and Dorset. The last of the farming on Kushog Lake stopped on the Harrison property in 1990. 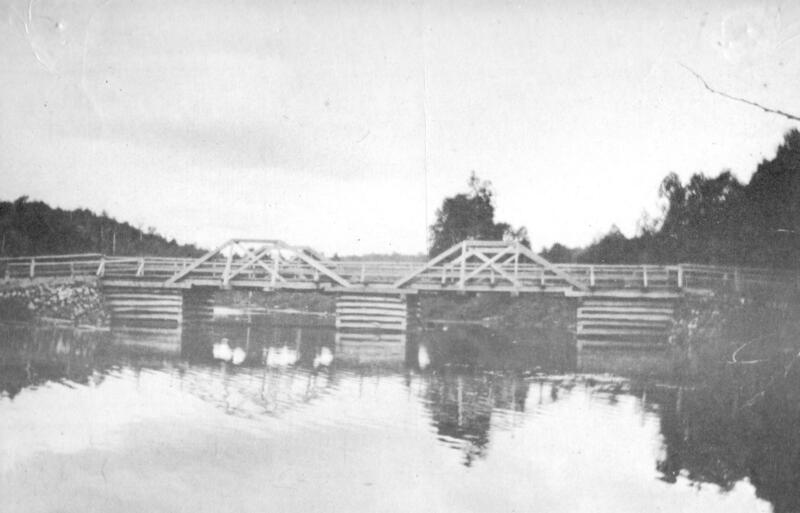 The first bridge over Kushog Lake at Ox Narrows was built as a winter project under the United Farmers Organization government of Ernie Drury in the early twenties. This was not a relief project (like Highway 35 in the 1930's) but a work project which was undertaken during the coldest months of the year. This wooden bridge burned in 1934 from a fisherman’s smudge fire and was replaced by a steel bridge. The original bridges were south of the current location.